New York: A glittering red carpet night at the Imagine Asian Theater in NY on November 8, 2008 when Hollywood and Bollywood came together for the premiere of one of the most talked about movies so far this year “Slumdog Millionaire”. “Slumdog Millionaire” is an incredible and highly recommended movie and has the Oscar buzz to prove it. The movie based on the novel “Q&A” by Vikas Swarup and screenplay written by the multi-talented Simon Beaufoy (The Full Monty) shows the world real India- a country where over a billiion plus people live, many in poverty who have dreams of making a better life for themselves and struggle daily to find the answer. It’s also home to lavish Bollywood, incredible culture, music, stylish fashion, global techology and of course people like “Jamal Malik”. At the Mahindra Indo-American Arts Council star studded red carpet NY premiere hosted by founder Aroon Shivadasani, I had a rare chance to interview the director of the masterpiece, the highly acclaimed Danny Boyle who was surprised at the incredible reaction the film has received from the American audience in such a short time. “I was always worried about the American audience reaction. I knew it would do well in England due to the strong connection we have with India but was a bit concerned about what western audiences would think” states the award winning director whose previous films have included “Trainspotting”, “The Beach” and “28 Days Later”. No need to worry here. All the major film critics have embraced it with open arms. “Slumdog Millioniare” was in fact well received with festival audiences. It took home “People’s Choice Award” from the prestigious Toronto Film Festival this past September and almost every major newspaper has given the film a glowing rating. There’s a reason why the critics and audiences have taken to the film believes Boyle. “The film depicts the main character Jamal as an underdog and a dreamer who fights to achieve his dream in everyway he can. I think the concept of rooting for the underdog is buried very deep into the American psyche which is why I think the American audiences are appreciating it” states the award winning director. 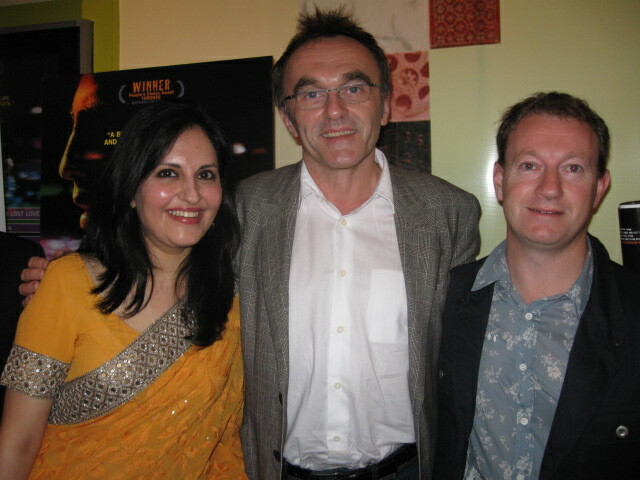 Boyle says by living in East London for years he himself has been exposed to Indian culture but his personal experience in India during the filming was something he never had experienced before. “I only really lived in Mumbai so I can’t really comment on whole of India but what I experienced, the people, the city is vibrant and has a great vibe all the time” states the director. Without giving to much away, ‘Slumdog Millionaire” is about Jamal Malik (portrayed by newcomer actor Dev Patel who should make room for his Oscar staute) a slum child with no future but dreams of making it big. Through his life experiences, he meets dangerous people, makes friends and enemies and falls in love with the beautiful Latika (portrayed by the stunning newcomer Freida Pinto). Footnote: Both young actors have never acted before in a movie and being their first film, you can see how brilliant casting director turned co-director Loveleen Tandon has a keen eye for talent. Patel and Pinto are simply amazing. 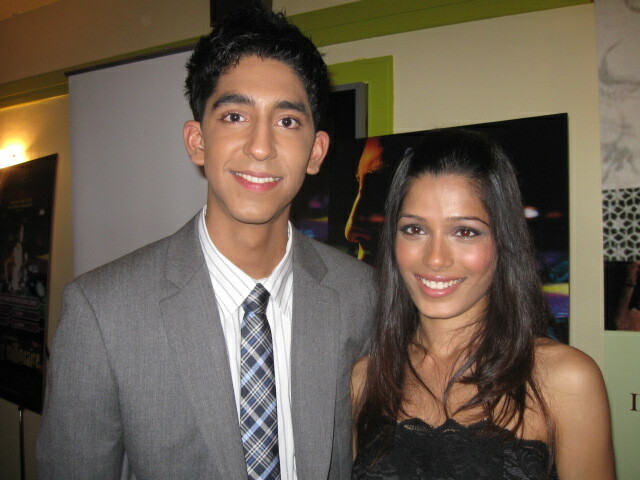 Dev Patel & Freida Pinto at NY premiere. Jamal’s life included a series of adventures, mishaps and complex situations that eventually help him on the popular TV quiz show “Who Wants To Be An Millionaire”. The “slumdog” becomes a chai seller for a calling center and like the rest of the world, gets hooked on to the show while working at the center. Jamal gets a chance to be on the show, starts to win money and soon becomes a target for the jealous and insecure host Prem Kumar played by Bollywood megastar Anil Kapoor. “Anil was great. He was a bit nervous working in an English movie although he speaks the language perfectly. I had never met him before and he helped out in many ways including guiding the studio audience during the scenes” states the director who also roped in other Bollywood top stars including Irrfan Khan (The Namesake” & “The Darjeeling Limited”) and top director/actor Mahesh Manjrekar. Prem engulfed with jealousy & suspicion makes it extremely challenging for Jamal to continue on the show but goodness prevails and Jamal ends up winning millions on the show bringing him unexpected fame, fortune and havoc. What happens next is what makes the story interesting and Oscar worthy. The sold out premiere was also graced by internationally known and award winning movie director Mira Nair, beautiful actress Sarita Choudhury, TV star Maulik Pancholy and actor Ajay Naidu. “Slumdog Millionaire” is one movie you do not want to miss this holiday season and when it gets to the Oscars, you, like the rest of the world, will root for “Jamal” to win! This is such a great post. the first of many for an ALL STAR RAVI YANDE!!!!!!!!!!!!!!!!!!!! !